Another familiar face is headed to the world of the live-action Dora the Explorer movie. Michael Pena has reportedly been cast as the father of the film's titular character, according to The Hollywood Reporter. Pena's casting comes shortly after Eva Longoria was cast as Dora's mother. Pena's filmography includes the Ant-Man franchise, A Wrinkle in Time, and End of Watch. Dora the Explorer will be a live-action update of the iconic Nickelodeon cartoon, which sees a high school-bound Dora finding herself leading Boots (her best friend, a monkey), Diego and a rag-tag group of teens on a Goonies-esque adventure to save her parents and solve the impossible mystery behind a lost Inca civilization. Isabela Moner will be portraying Dora, and a first-look photo of her in costume was released earlier this month. The film's cast will also include Eugenio Derbez, Micke Moreno, Nicholas Coombe, Madeleine Madden, Adriana Barraza, and Temura Morrison. The project was first announced in October of last year, sparking some intrigue and pretty creative fan art online. The film will be directed by Alice Through The Looking Glass' and The Muppets' James Bobin, with a script from Danielle Sanchez-Witzel and Neighbors writer-director Nicholas Stoller. Michael Bay's Platinum Dunes production company, and his partners Andrew Form and Brad Fuller, were believed to be producing, but that has since been denied. Production recently began in Australia. 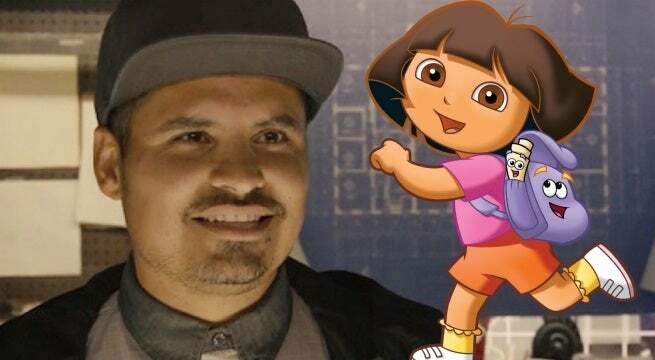 Are you excited to see Pena join the cast of the live-action Dora the Explorer? Let us know what you think in the comments below. Dora The Explorer is expected to be released on August 2, 2019. ComicBook.com will provide any updates as they come about.